The coffin of six-time world motor-racing champion Geoff Duke will be driven on a lap of the Isle of Man TT course later, ahead of his funeral. A hearse will leave the TT grandstand on Glencrutchery Road in Douglas at 14:30 BST followed by family members. Bikers and fans have been invited to follow the procession around the course. Geoff's sons Peter and Mike will both follow the hearse on motorcycles as their own tribute. Peter Duke said: "Mike and I thought that the last lap this weekend would be an appropriate opportunity for any local fans to pay their last respects to our dad. "Anyone is welcome to follow on bikes or in cars. The more variety of machinery, the better." He said the funeral itself would be for family and friends only, in accordance with his father's wishes. 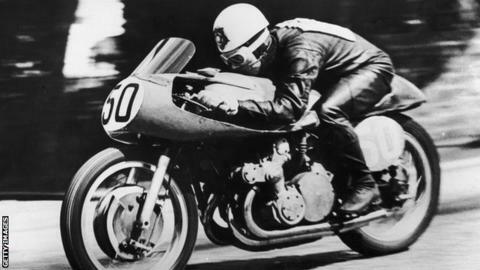 Geoff Duke was the first major star of motorcycle racing and was awarded an OBE in 1953.